This book critically engages with the contemporary breakdown of trust between Muslim and non-Muslim communities in the West. It argues that a crisis of trust currently hampers intercultural relations and obstructs full participation in citizenship and civil society for those who fall prey to the suspicions of the state and their fellow citizens. This crisis of trust presents a challenge to the plurality of modern societies where religious identities have come to demand an equal recognition and political accommodation which is not consistently awarded across Europe, especially in nations which view themselves as secular, or where Islamic culture is seen as alien. 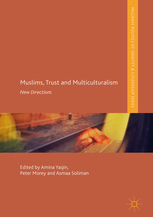 This volume of interdisciplinary essays by leading scholars explores the theme of trust and multiculturalism across a range of perspectives, employing insights from political science, sociology, literature, ethnography and cultural studies. It provides an urgent critical response to the challenging contexts of multiculturalism for Muslims in both Europe and the USA. Taken together, the contributions suggest that the institutionalisation of multiculturalism as a state-led vehicle for tolerance and integration requires a certain type of trustworthy ‘performance’ from minority groups, particularly Muslims. Even when this performance is forthcoming, existing discourses of integration and underlying patterns of mistrust can contribute to Muslim alienation on the one hand, and rising Islamophobia on the other.